What's in store for your sign this season? 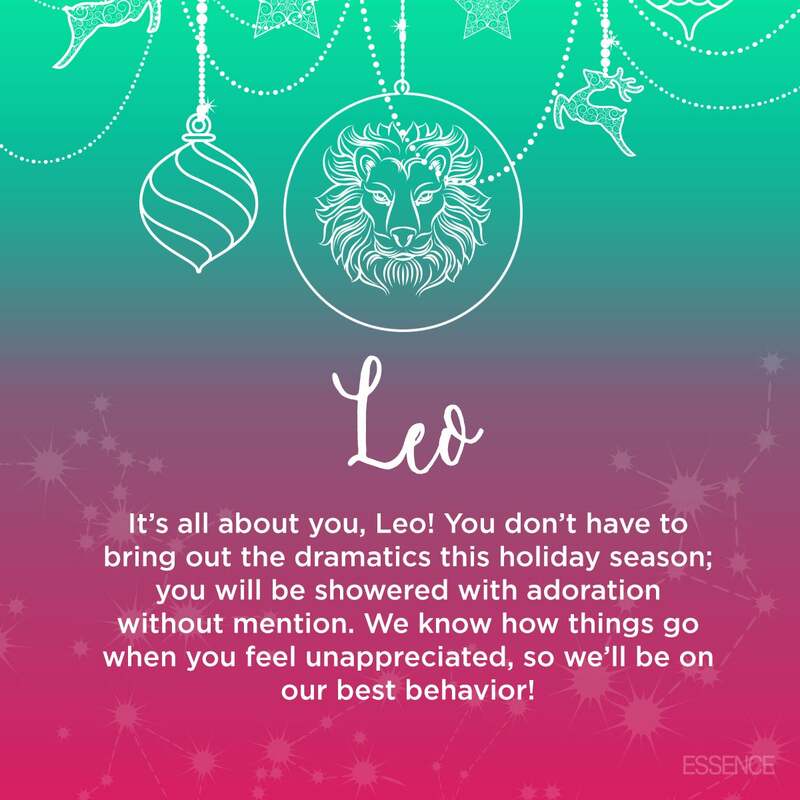 Dope astrologist Danielle Ayoka's holiday life advice is right on time. 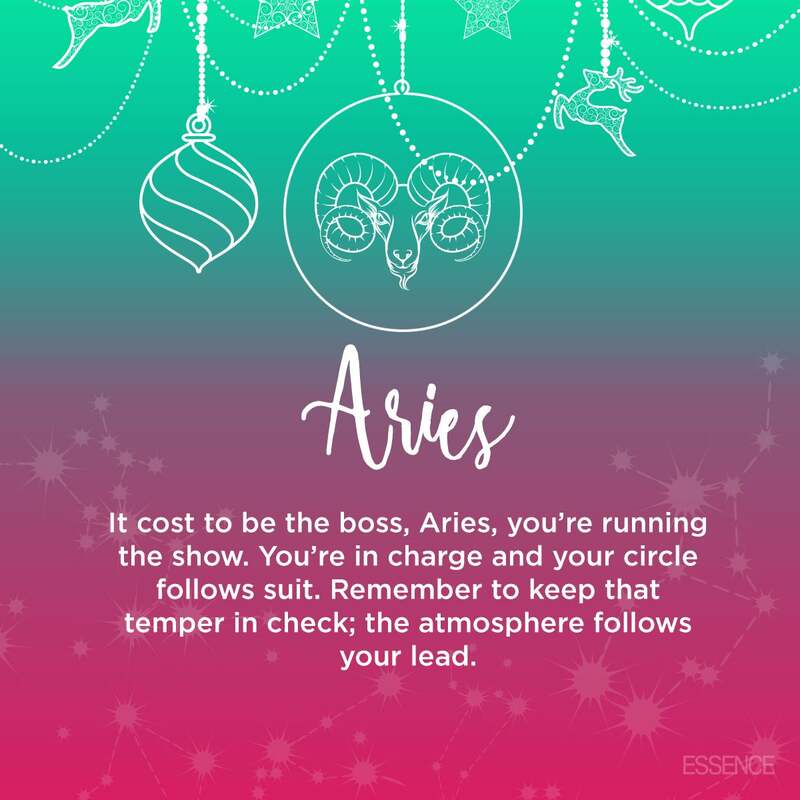 It cost to be the boss, Aries, you’re running the show! You’re in charge and your circle follows suit. Remember to keep that temper in check; the atmosphere follows your lead! 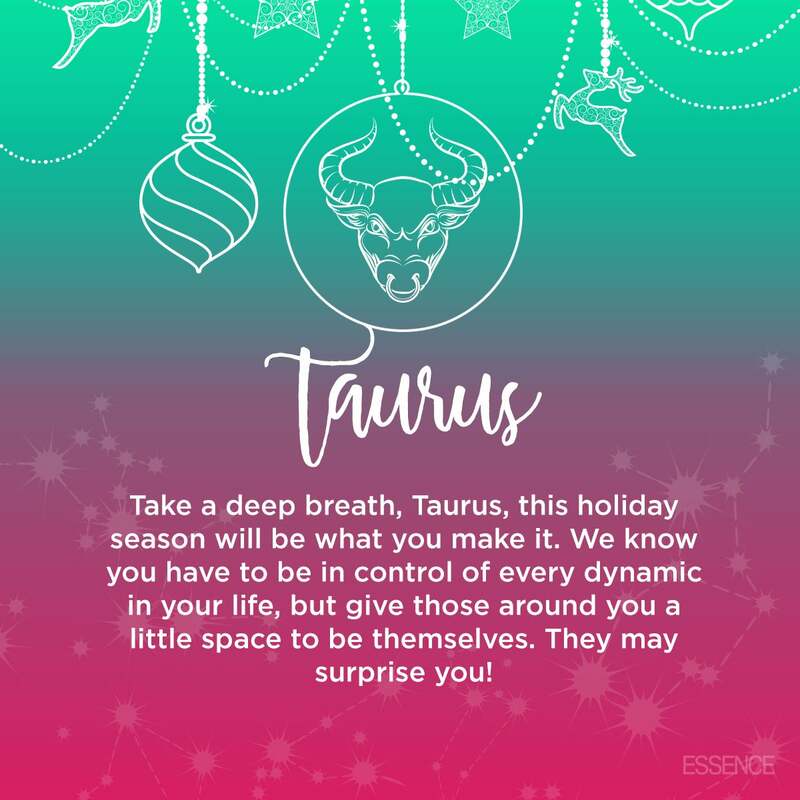 Take a deep breath, Taurus, this holiday season will be what you make it. We know you have to be in control of every dynamic in your life, but give those around you a little space to be themselves. They may surprise you! 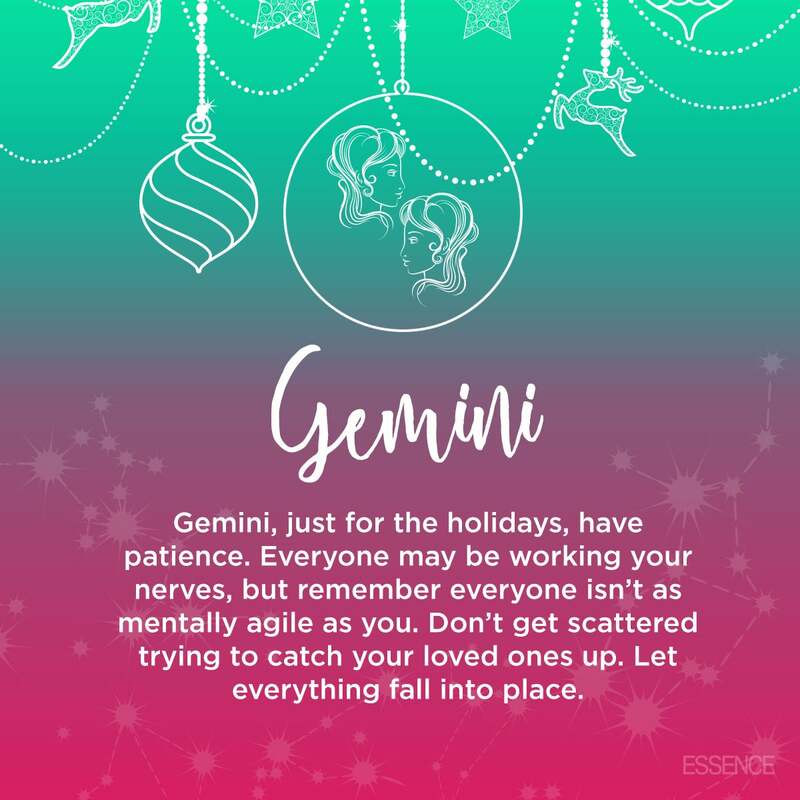 Gemini, just for the holidays, have patience. Everyone may be working your nerves, but remember everyone isn’t as mentally agile as you. Don’t get scattered trying to catch your loved ones up. Let everything fall into place. 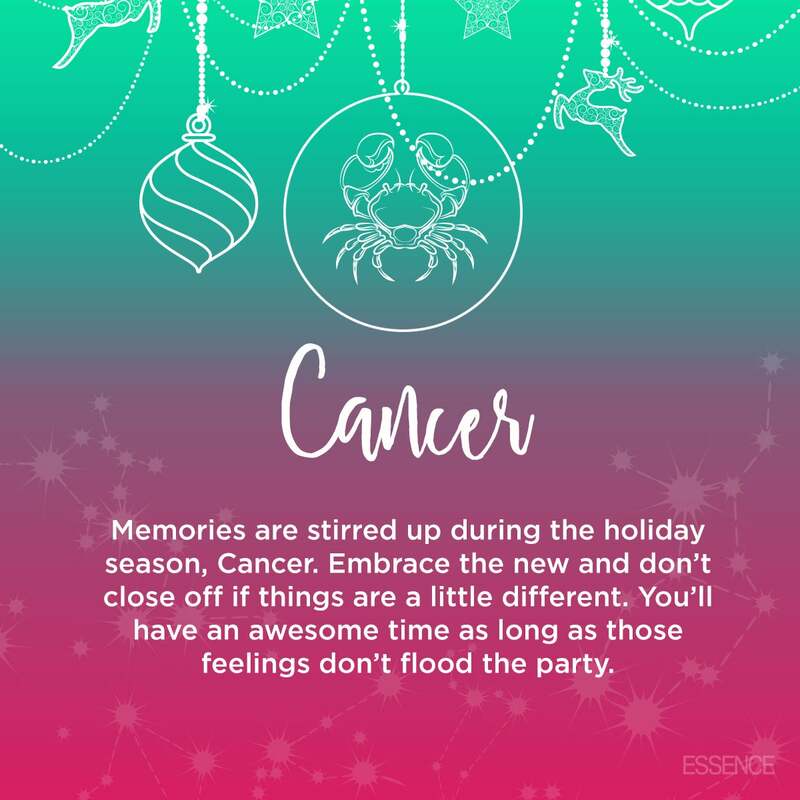 Memories are stirred up during the holiday season, Cancer. Embrace the new and don’t close off if things are a little different. You’ll have an awesome time as long as those feelings don’t flood the party. It’s all about you, Leo! You don’t have to bring out the dramatics this holiday season; you will be showered with adoration without mention. We know how things go when you feel unappreciated, so we’ll be on our best behavior! 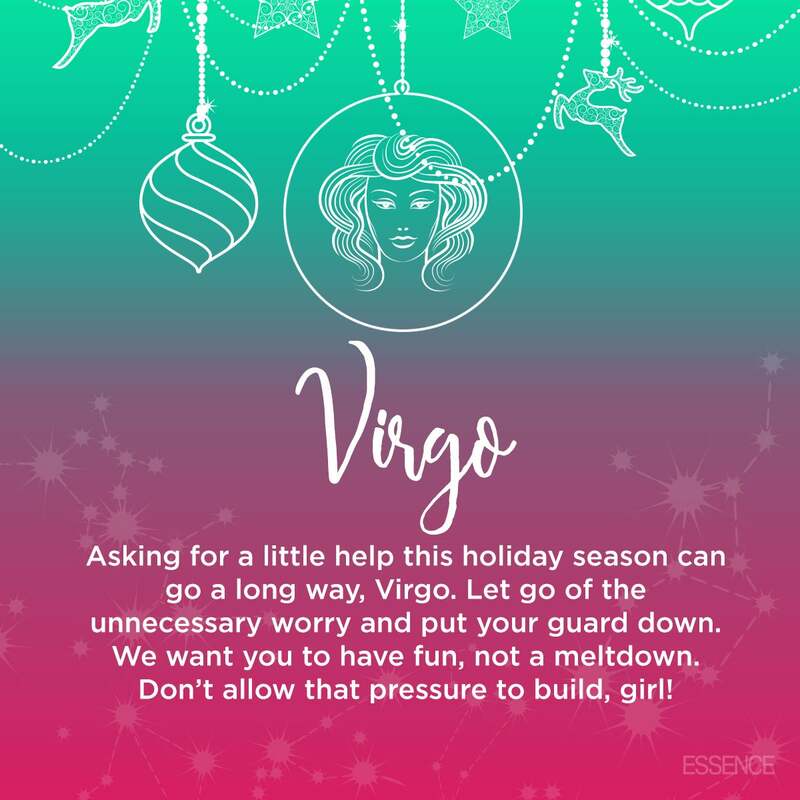 Asking for a little help this holiday season can go a long way, Virgo. Let go of the unnecessary worry and put your guard down. We want you to have fun, not a meltdown. Don’t allow that pressure to build, girl! 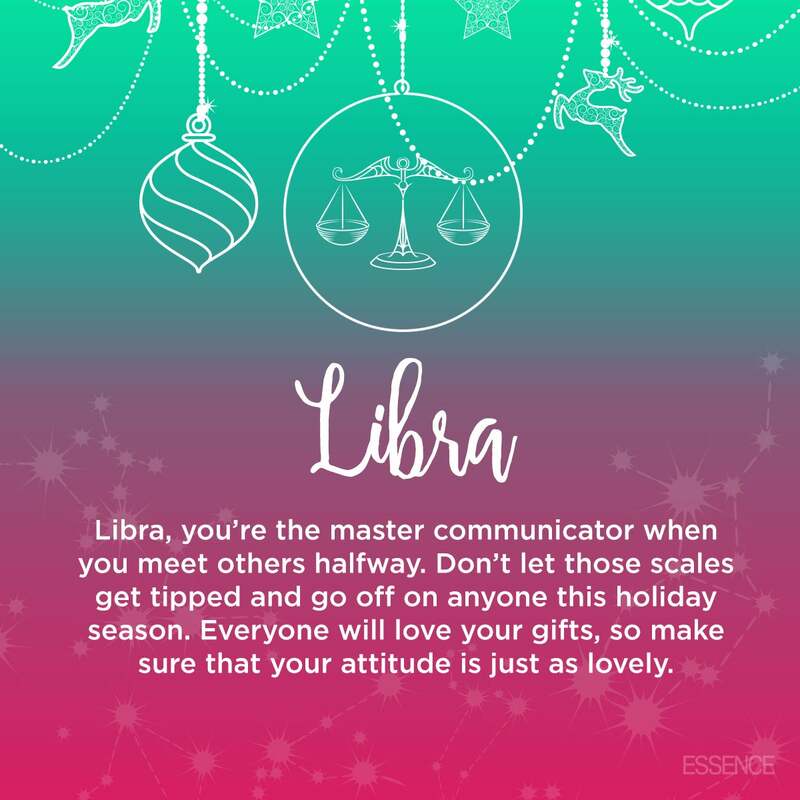 Libra, you’re the master communicator when you meet others halfway. Don’t let those scales get tipped and go off on anyone this holiday season. Everyone will love your gifts, so make sure that your attitude is just as lovely. 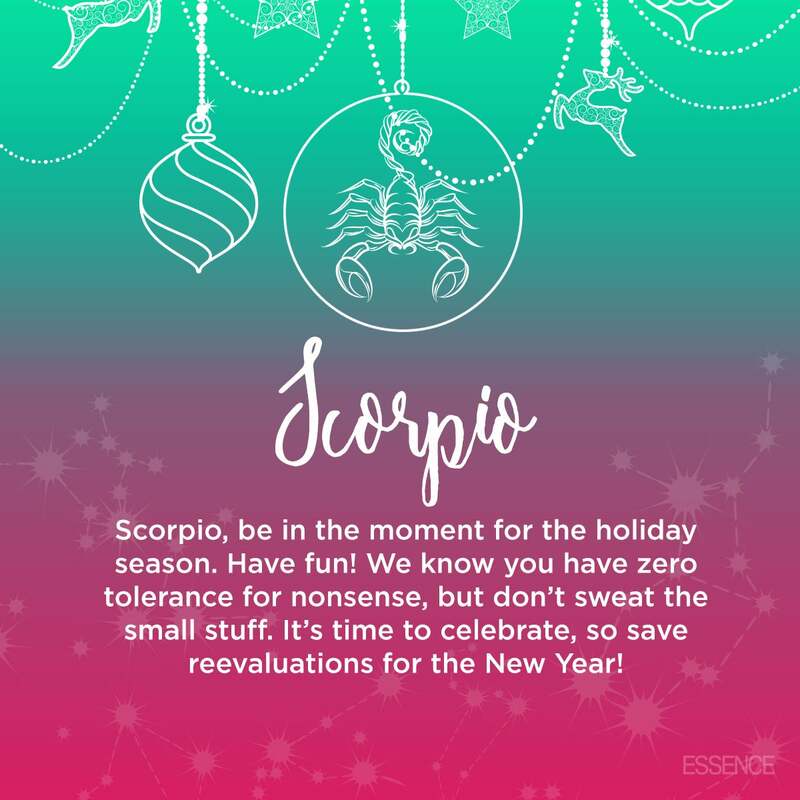 Scorpio, be in the moment for the holiday season. Have fun! We know you have zero tolerance for nonsense, but don’t sweat the small stuff. It’s time to celebrate, so save reevaluations for the New Year! 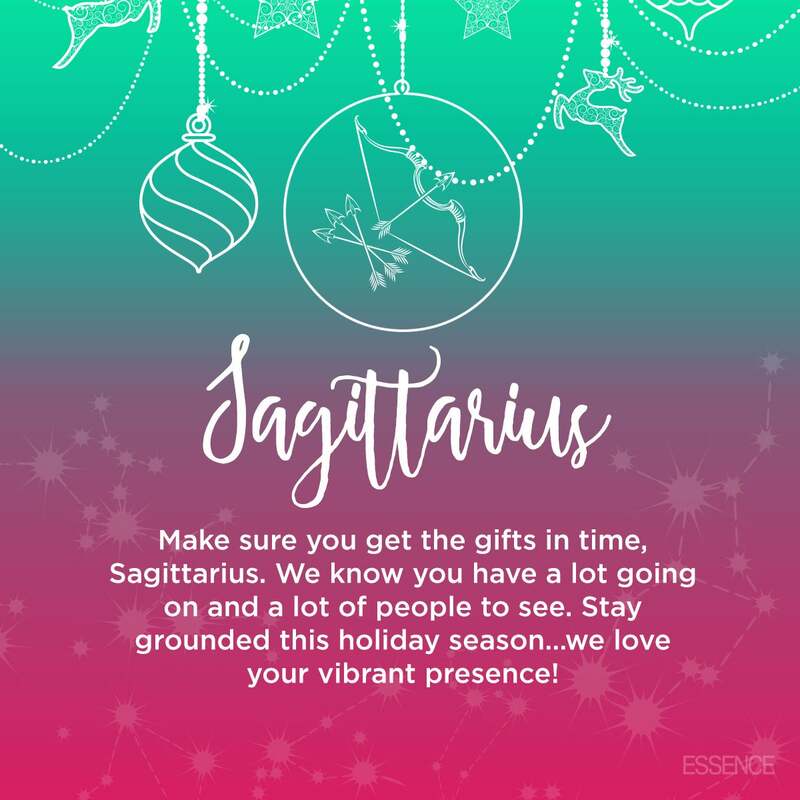 Make sure you get the gifts in time, Sagittarius. We know you have a lot going on and a lot of people to see. Stay grounded this holiday season…we love your vibrant presence! 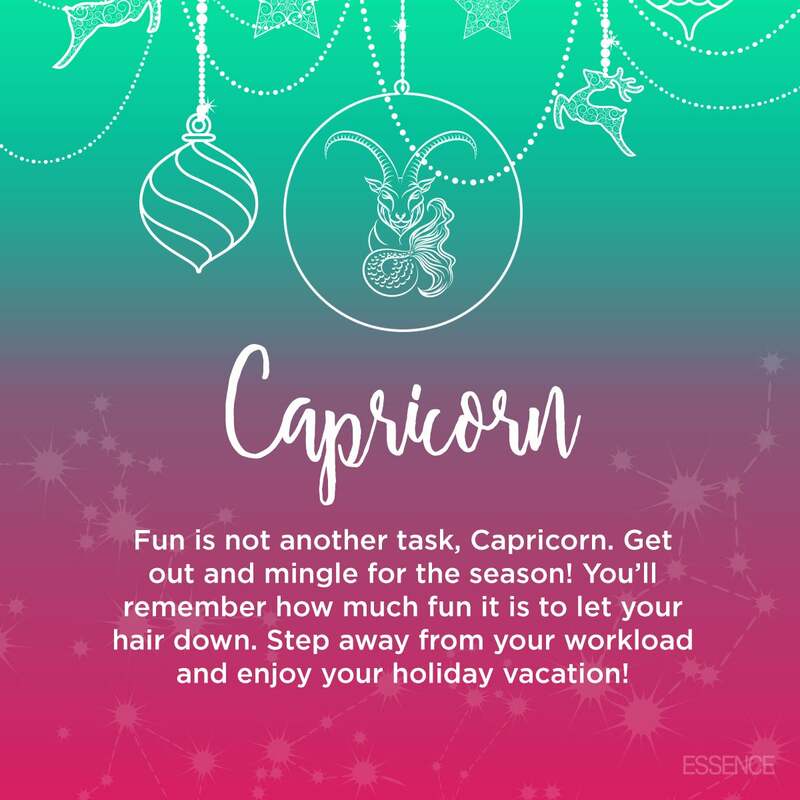 Fun is not another task, Capricorn. Get out and mingle for the season! You’ll remember how much fun it is to let your hair down. Step away from your workload and enjoy your holiday vacation! 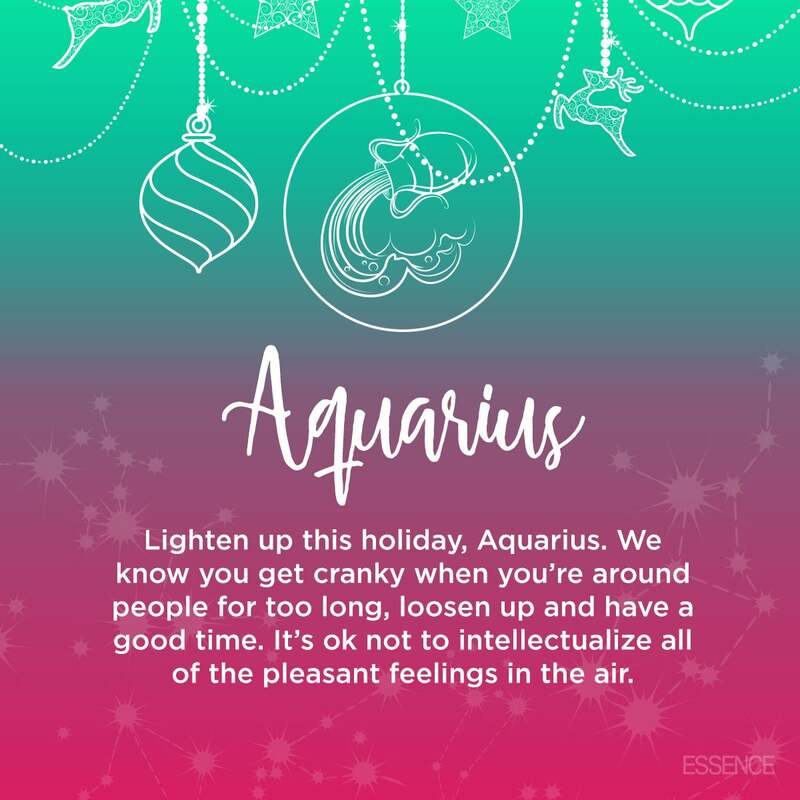 Lighten up this holiday, Aquarius. We know you get cranky when you’re around people for too long, loosen up and have a good time! It’s ok not to intellectualize all of the pleasant feelings in the air. 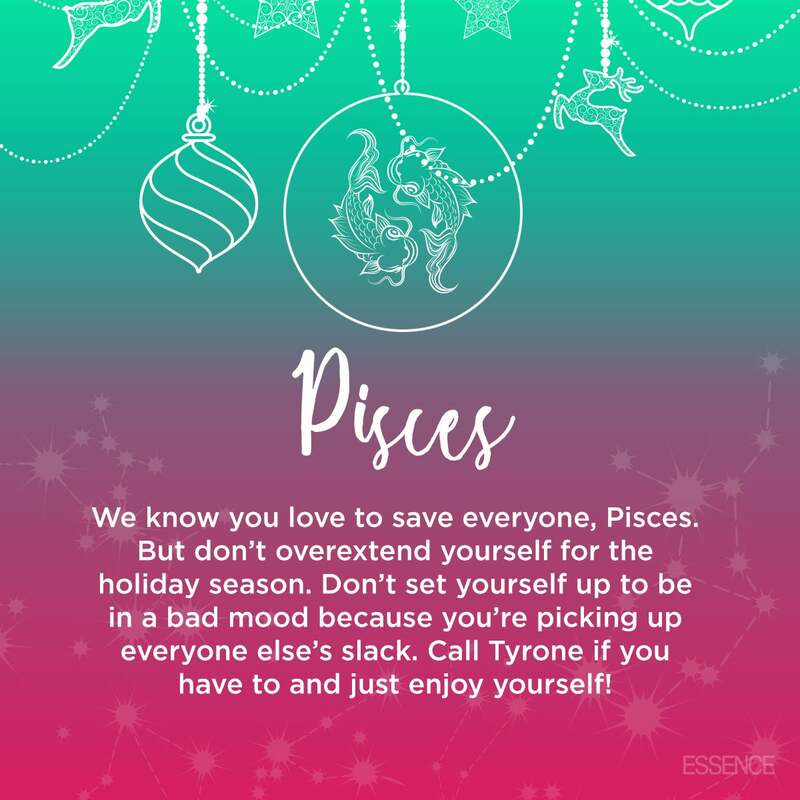 We know you love to save everyone, Pisces. But don’t overextend yourself for the holiday season. Don’t set yourself up to be in a bad mood because you’re picking up everyone else’s slack. Call Tyrone if you have to and just enjoy yourself!